Faith, Coffee & Love : Don't worry folks...I'm okay! Really I’m fine… I know I've dropped off the face of the earth again but in my defense it is a crazy time we live in right?? I mean really who on earth would think of training for their first ever half-marathon during the busiest time of the year??? Not I says me…but then again me would be wrong! HA! It has been a true mess these past 4 weeks, the holidays alone make it so that moms everywhere are busy with Thanksgiving and Christmas and the shopping and family and parties and eating! But trying to keep up with my running has made it even more of a challenge, SO just to be clear and we all understand - I am still running. I've missed a run or two in the process but that’s it. I’m still on board. I've eaten like a cow and for a couple of weeks and I felt almost like I did in the beginning when I would run…sluggish and heavy and exhausted. I understand more than ever that eating sooooooo wrong for even a short time can take a toll on your endurance and overall feeling or well-being. Yes I know you think I sound like some cheesy commercial or something but really and truly it makes a BIG difference! So just one week of better eating – mind you not great eating- I’m still at war with some of those wonderful awful habit of eating carbs and sweets. I naturally love me some carbs and sweets – especially chocolate! NOM NOM NOM I can eat that stuff allllll day long if you let me…. chips and salsa are another yummy treat for me. If you take me to a Mexican Restaurant I will be full before my meal comes – NO JOKE! SO with all this said I’m on the right track, my running felt MUCH easier this past week and so I’m good. Of course the half-marathon in only 5 days away… eek! So my last big run was this past Sunday and I ran 11 miles just to be on the safe side!!! 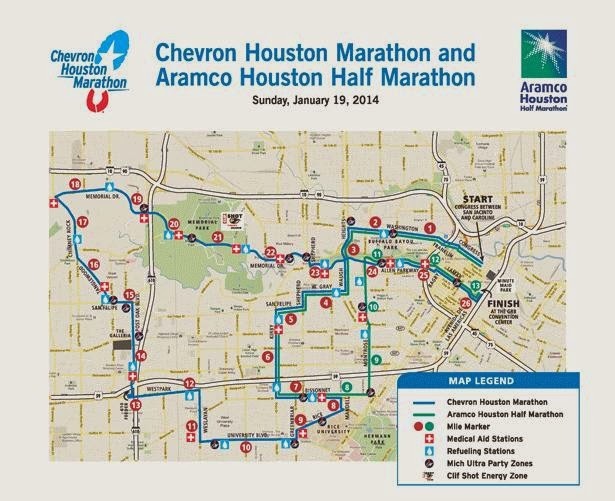 Here is a picture and link to the map we will be running… you see there where mile 11 is??!! I can run all of that! From there on it should be a straight shot to the finish!! Although a wise man said to me once “it ain’t nothin’ but a thang!” I may have a couple of times when my nerves have gotten the best of me…. I try not to think about it too much and I know this, even if I walk across that finish line I will finish. SO here is what they tell you to do” set three goals” the best case scenario, the simple and understandable scenario and the okay if all you do is finish scenario. Or something along these lines :) So my goals have been set, I would love to finish at 2:45 time frame, if that is not going to happen then a few minutes more will be okay, and of course if I were to get hurt or at some point feel as though I can’t run anymore then I will walk, limp or crawl to the finish. I know that to you crazy runners (ahem no names mentioned here) think this is not a big deal but I guess the bottom line is that it is a big deal to me. I am going to commit to keeping you posted - I will write a race report and I am going to keep a journal of the happenings before and after. I promise.